Steven Davis is a very versatile singer and a performer with many talents. He started singing gospel in his Midwest hometown church, and discovered a passion for Frank Sinatra, Tony Bennett, and big band sounds. Later, he wowed club audiences in NYC, Atlantic City and L.A. He has also performed with orchestras and big bands outside the USA. His passion for those classic singers can be heard in his new full scale recording project, a really dynamic album, The Way You Look Tonight. This album pays homage to those iconic artists from an era when songs really did have soul. The arrangements with Andy Farber and his orchestra are truly powerful. He says those poetic lyrics penetrate your heart. Steven tells us about his new project, and we have a video of the iconic “Luck Be a Lady,” that you can listen to. AG: What can you tell us about your inspiration for this great project? Steven Davis: Ever since I was a kid, I’ve had a love affair with the great classic songs of the past century. All my life, I’ve held a great deal of admiration and respect for the great artists who have interpreted the music of the great America songwriters, with such grace and style. AG: Why did you decide it was the right time for a new approach to this music? Steven Davis: Over the past few years, I’ve written and recorded many original songs in the same language of the big band era, with my co-writer and producer, Josh Charles. We thought it was time to record a group of iconic, timeless classics we all know and love, with a fresh approach and interpretation. AG: There are so many great classics. How do you choose? Steven Davis: Because they’ve been rendered by the most revered artists of all time, the challenge is to bring something unique to these iconic songs. Choosing the songs is the first step. One of the songs on this recording is from a big hit by the Platters in the 50’s, “Only You.” We’ve given the song a fresh spin, setting it apart by setting it down in the cool and easy swing of Andy Farber’s amazing arrangement. 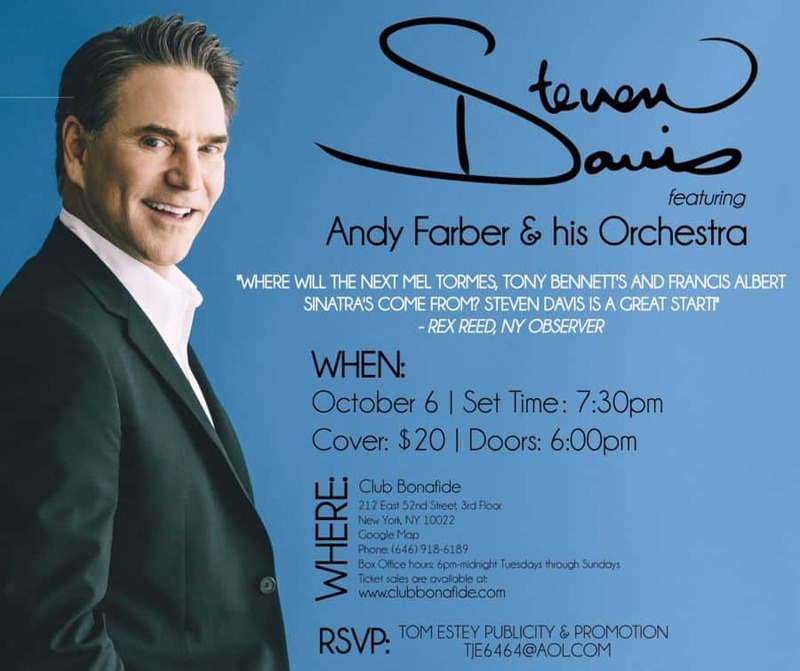 Steven Davis promotional poster, featuring Andy Farber and his orchestra. AG: You’ve brought new life to these songs. How did you do that? Steven Davis: One of the most iconic of all songs is “Luck Be a Lady.” Josh and Andy spent a lot of careful consideration, mapping out ways to avoid a mere copy of past recordings. Andy brilliantly nailed this arrangement with just a taste of the unexpected. I wanted “The Way You Look Tonight” to be a full throttle – big band swing tribute to those singers and song writers who have taught me so much through the years, and who have been such a source of musical inspiration. AG: What do you like most about singing these classics? Steven Davis: Artists of today live in the shadows of the greats, from Sinatra to Bennett. Its a privilege to carry on the tradition of this American treasury of music, keeping it alive for future generations! AG: I see your website has some great tracks our readers can listen to, and your music is on iTumes. Steven Davis: Yes, it is www.stevendavismusic.com/epk, and there’s more on iTunes. Alan Gray is the Publisher and Editor-in-Chief of NewsBlaze Daily News and other online newspapers. He prefers to edit, rather than write, but sometimes an issue rears it’s head and makes him start hammering away on the keyboard. Alan has been on the internet since it first started. He loves to use his expertise in content and digital marketing to help businesses grow, through managed content services. After living in the United States for 15 years, he is now in South Australia. To learn more about how Alan can help you with content marketing and managed content services, contact him by email. Alan has a fascination with shooting video footage and video editing, so watch out if he points his Canon 7d in your direction.